Ever wondered how Communism tastes? Now you get a chance to step back in time and try dishes cooked up based on original Soviet Regime recipies like Langosh, Drztkova, Topinky, Treska and more. 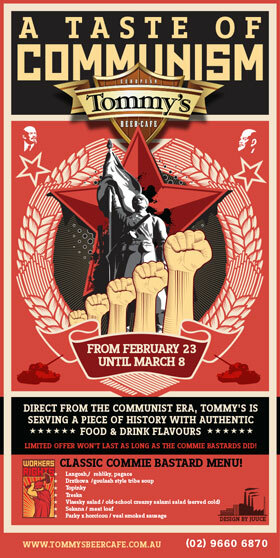 Don’t miss out this culinary cultural highlight at Tommy’s – book now – as you know, it won’t last long! Call us to book a table (02) 9660 6870. 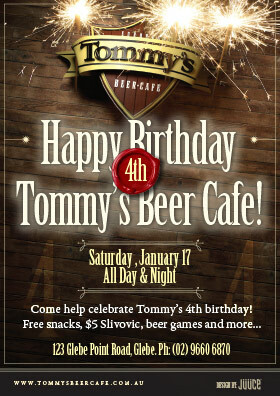 Everything started 4 years ago when Tommy decided to open a Czech Beer Cafe in Glebe called Tommy’s Beer Cafe. Since then we served awesome beer and food. Four years on it’s time to celebrate once more the anniversary of one of Sydney’s best Beer Cafe’s. Come an join us Saturday 17th all day and night and celebrate with Tommy!! What’s on? Free snacks, $5 shots, beer games and more… everything for a fun atmosphere. Book in the date – call us to book a table – or just turn up! Happy Birthday Tommy’s! Ever wanted to have a pig for Christmas? Now you can! Break the perpetual boring Christmas habits – instead book a table at Tommy’s for a sensational experience for Christmas time! 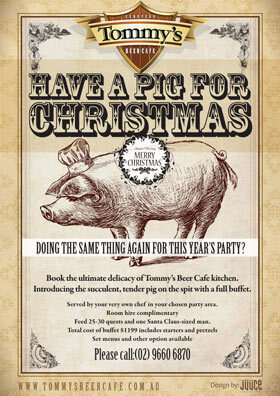 Don’t miss out on the succulent, tender pig and buffet – call (02) 9660 6870 to book a table. 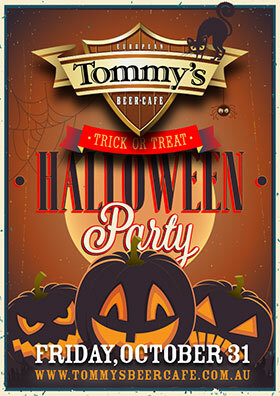 Come to Tommy’s to celebrate Halloween like never before! With Beer and Schnitzel! What a scary thought… book now for a fun event. Have you ever been at the Oktoberfest? 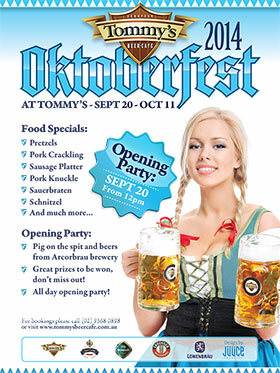 Even if you have, it’s time to get ready for the Tommy Oktoberfest experience! 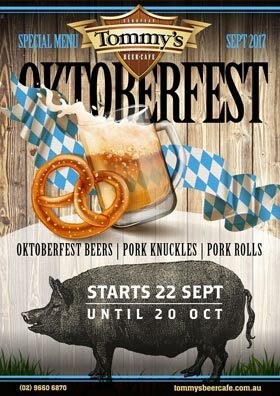 Tasty pork and fantastic European Schnapps and obviously great Oktoberfest beer! Join us for the opening party on the 20th of September or book a table now to don’t miss out! Celebrate Father’s Day at Tommy’s Beer Cafe. 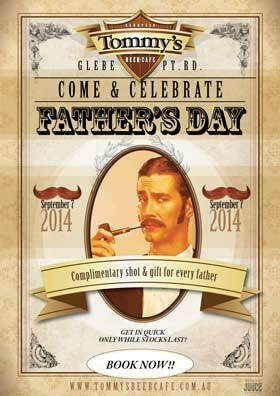 Every father gets a complimentary shot & gift! Don’t miss out – book now – only while stocks last!